These no bake mini cheesecakes are for those days when you want luxurious, creamy, New York-style cheesecake but without all the work. With no-bake cheesecake this good, you may just find no need to bake cheesecake ever again. Hello from our new home! Some of you (TUB subscribers mostly – subscribe here for inside scoop!) may remember that we sold our condo in the city for a place in the suburbs. The last two weeks (last two months actually) have been pure chaos but here we are, slowly but steadily settling in nicely. In fact it was such a fantastic day today I had lunch in our lovely little backyard deck! What I am having a teeny tiny issue with though is the existing oven. We are not friends yet. I don’t know if it has hot spots and where. Whether it runs hot or not. Baker problems. Enter these no-bake mini cheesecakes. We shall not let wonky ovens stop us from enjoying life’s little treats, right? These cheesecakes are so easy to make and so good, you may actually not want to bake cheesecakes ever again! 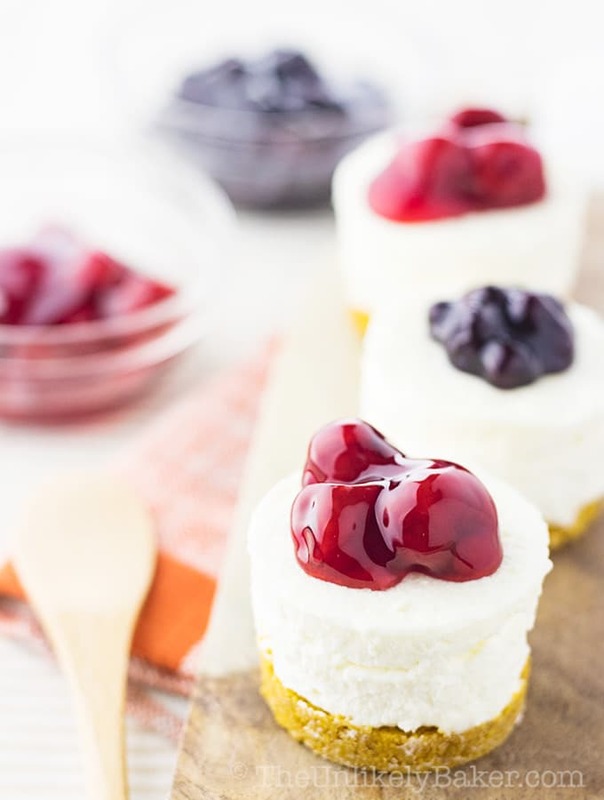 I have a recipe for Mini Cheesecakes which I absolutely love. I top them with jam, swirl those around to make a pretty marbly effect, and bake them. so the cheesecakes are easier to remove. Back to these cheesecakes. They are delicious if I say so myself! You know how no-bake cheesecakes sometimes have texture that’s closer to mousse or sometimes gelatine? These cheesecakes are not like that. Their texture is close to baked cheesecake nobody was able to tell it wasn’t baked when we served them at a party one time. It’s legit! It’s not as dense as New York cheesecake but it’s firm and creamy and tastes amazing. 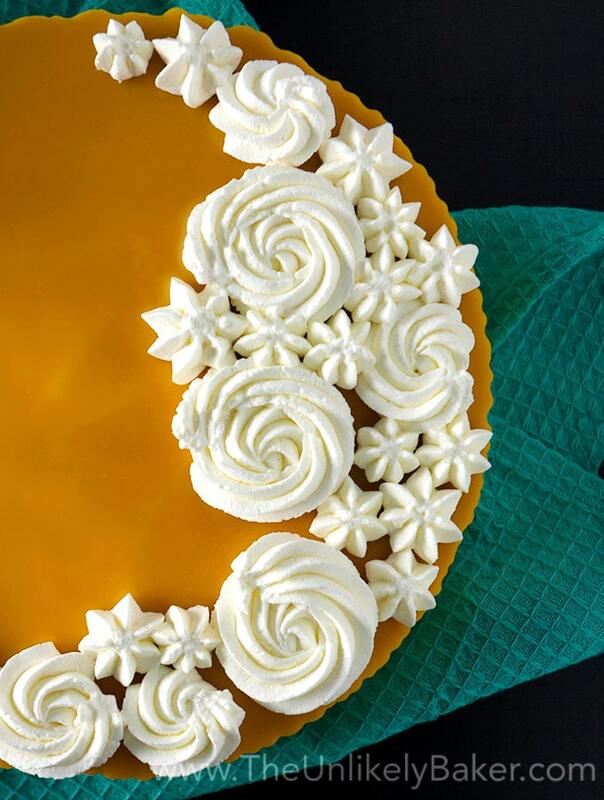 With whipped cream and mascarpone cheese, every bite is to die for. You can eat these on their own but you can also top with your favourite things. I just bought canned cherry pie filling and canned blueberry pie filling for this batch but the possibilities are endless – berry coulis, lemon curd, salted caramel, chocolate ganache. So go ahead and make it your own. Minimal effort, maximum reward. Those are the best recipes aren’t they? These no bake mini cheesecakes are for those days when you want luxurious, creamy, New York-style cheesecake but without all the work. If using a mini cheesecake pan with removable bottom, lightly grease sides and bottom of each cavity. If using a cupcake pan, line the pan with cupcake liners. Set aside (see notes). In a large bowl, combine all ingredients for the crust until evenly moist. Scoop a heaping tablespoon into each cavity/cupcake cup and press firmly down into the bottom of the pan (see notes). Chill while preparing the filling. In another large bowl, beat 2 blocks of cream cheese, 1 tsp vanilla and 1 cup sugar until smooth and incorporated (about 2-3 minutes on medium speed). In a separate bowl, whisk 1/2 cup mascarpone cheese and 1 cup heavy cream until they form stiff peaks (about 2-3 minutes on medium/high speed). Fold into your cream cheese mixture. Transfer the filling into your prepared pan and chill 4-6 hours or until set (preferably overnight). Serve with your favourite toppings (optional). This recipe yields 24 cheesecakes so you would need 2 standard size (12-cavity) pans. I use prepared graham cracker crumbs which are very finely crushed. I usually use a shot glass to pack in the crust. You can also use the back of a spoon. 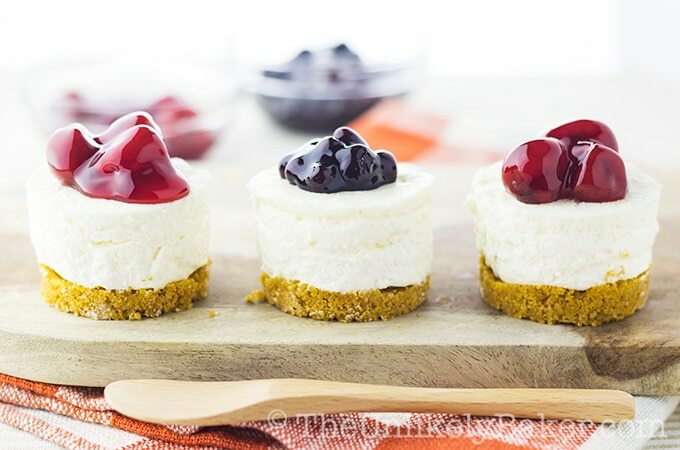 Did you make no bake mini cheesecakes? I’d love to hear from you in the comments section below. 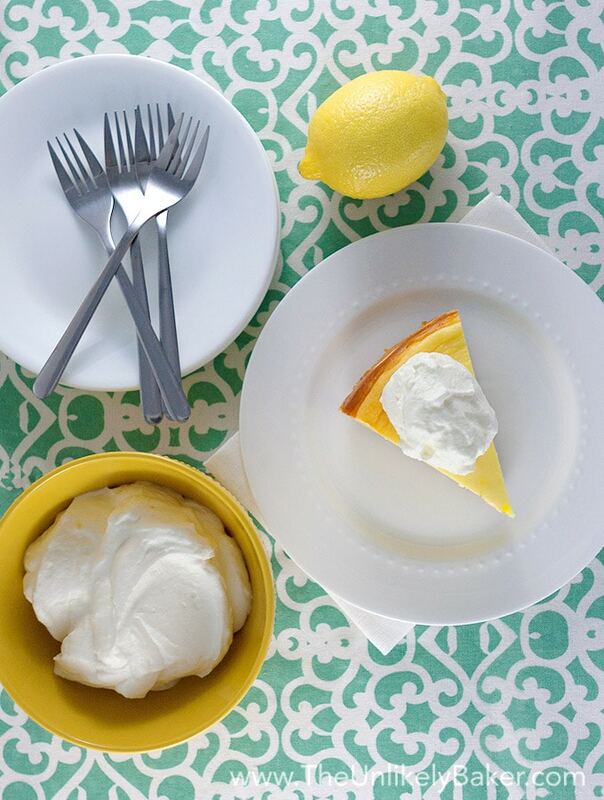 The Best Lemon Cheesecake. Ever. And let’s get social! Find me on Facebook, Pinterest, Instagram, Twitter, Google+ and Flipboard. These look so yummy!!! Can you freeze these? Thanks Dana! I haven’t tried so I can’t say for sure. 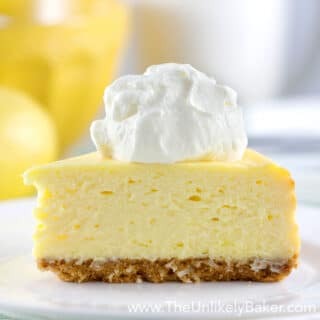 I did find this article for you: https://www.livestrong.com/article/485807-how-to-freeze-a-no-bake-cheesecake/ Hope it helps! Thank you so much!!! This helps! These were a hit in our office potluck! I thought about just buying a cake but everyone was bringing something homemade and my cheesecakes were the first to go. I didn’t have the fancy pans so I put them in cupcakes. They’re so good! I have requests to make them again. I bought the canned cherry topping. Thank you! Hello Shio! You are most welcome. I’m glad you decided to bring something homemade 🙂 And that you and the gang liked the cheesecakes! Hope you’re having a lovely Sunday. I love how uniform and pretty these look. Perfect for a party and the ideal treat to layer all sorts of fruit and confections on top! 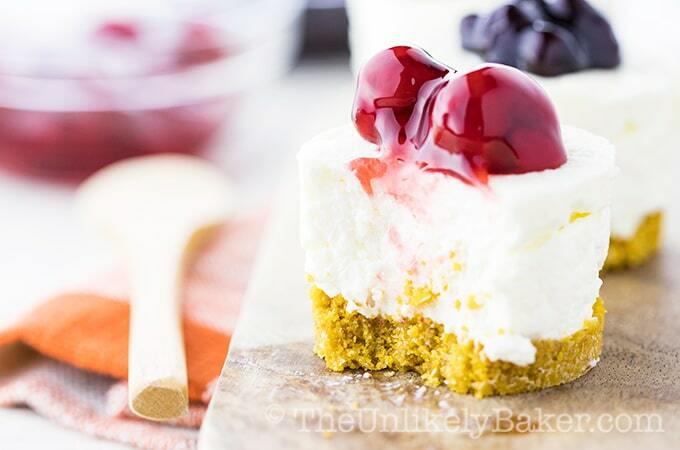 These mini cheesecakes look so good! The marble effect is so great. 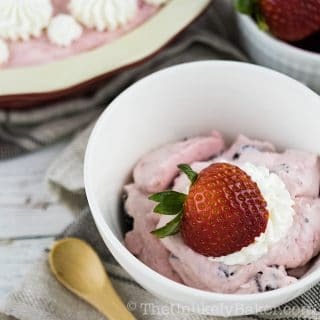 I love no-bake recipe, it’s the best for summer. Thank you for the recipe! Congrats to moving! I hope you can relax a bit now after all the hassle. 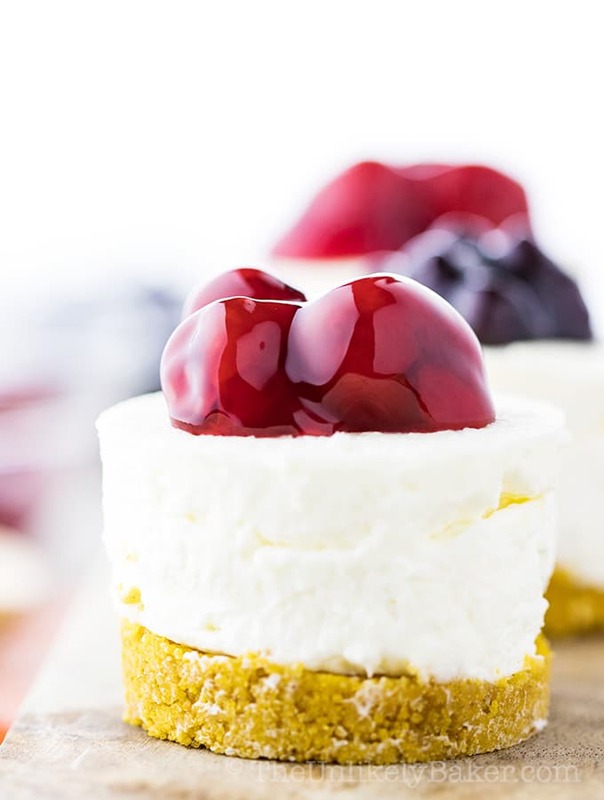 🙂 These no bake mini cheesecakes look divine! I love how the fruit is so shiny you could almost see your reflection inside! Thanks Natanja! 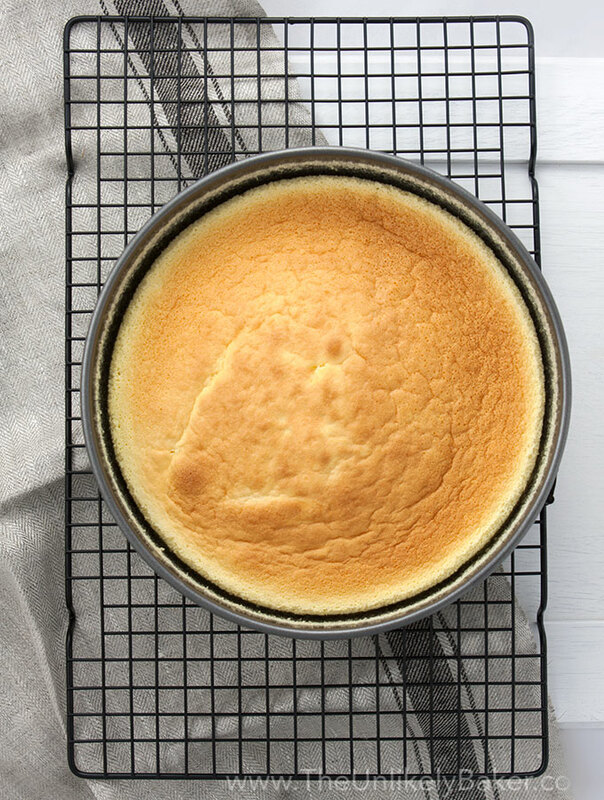 Do you have a mini cheesecake pan? Those things are adorable. Have a happy week! I love cheesecake but I have never been brave enough to try to make it myself. 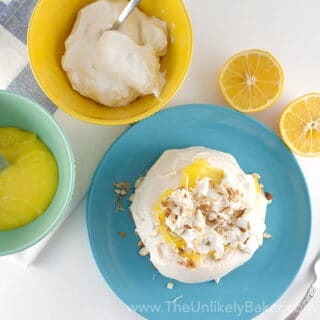 I’m still pretty darn intimidated but I just might be able to pull off these yummy no-bake mini cheesecakes. I’m definitely craving them now! This would be perfect for a dinner party. Have a decorate your own cheesecake bar and people can add whatever they want! That is an awesome idea! Oh my goodness is this real life?! Lol. You are speaking straight to my heart here! I cannot wait to try these! 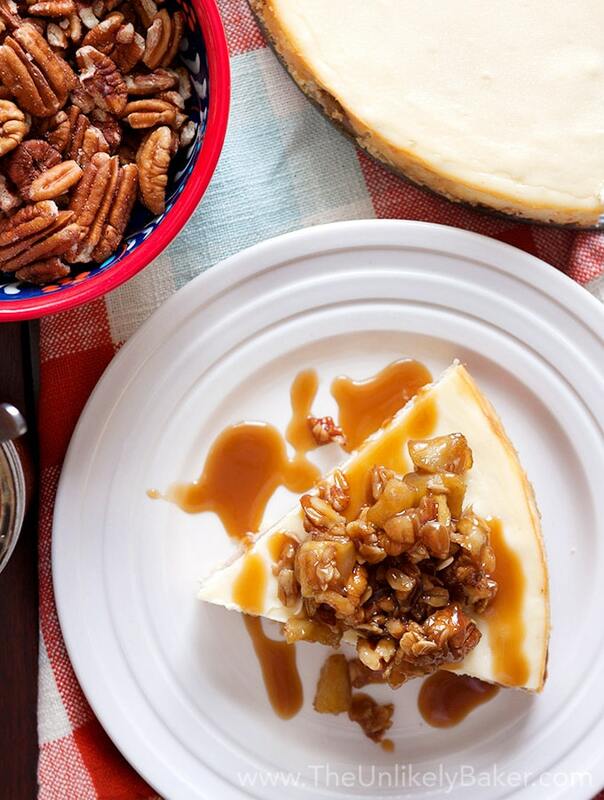 You had me at cheesecake…… sigh. Those mini cheesecakes look so very delicious, I’d love to try one! The pictures of the cakes are delicious. I will definitely try your recipe this weekend. I love cheesecake, and it’s one of my husband’s favorite desserts. This looks so simple, and we are about to head to the grocery store soon so I can get the few things we are missing! “NO BAKE” = MUSIC TO MY EAR!!! Ahhh cheesecake is my favorite! 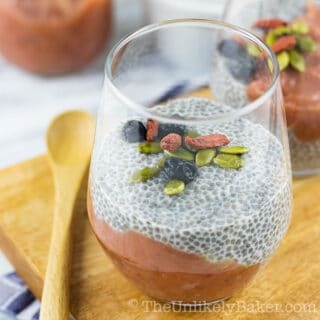 I need to try this recipe it looks amazing! 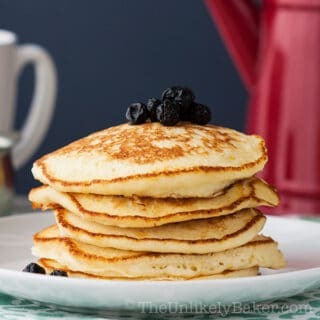 These look so luscious and delicious – and yet I bet they’re also super-easy, based on your recipe! I love all your topping ideas, too! Oh my word! 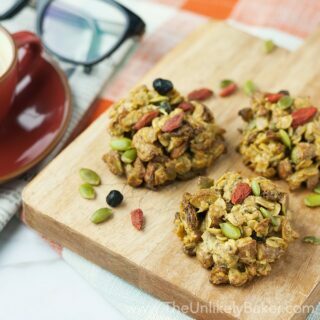 These are so delicious looking and the recipe is easy too! I’m drooling just looking at these gorgeous treats. These look absolutely DELICIOUS. I may have to make some soon. Or attempt it anyway. I love these mini cheesecakes. Making dessert in serving sizes is always a great idea. I love this recipe because it is no bake. What a winner! Thank you! Mini desserts are always a winner in my book. You had me at no bake! 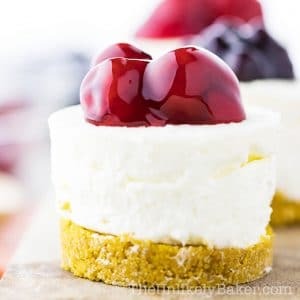 These bite size cheese cakes look super delicious! I love that they are no bake. There used to be a kit I’d buy to make no-bake cheesecakes. I haven’t thought of that in years. I wonder if they still make it. I love mini cheesecakes. My biggest problem is that I eat way too many of them. This no bake recipe will make a great addition. These look so pretty and professional! I imagine they’re so creamy and good too. The minimal effort thing, I really like! I think we all do that with cheesecake LOL!! These look so yummy! I love that making mini versions makes it possible to make all kinds of different flavour toppings at once to mix and match. I love a good mini dessert and especially a cheesecake! These are so something the hubs would love! Those are SO cute! The perfect way to serve cheesecake at a party, for sure! You had my attention with the word cheesecake, which is my favorite dessert. I always prefer baked over nobake because nobake doesn’t usually taste like cheesecake so I;m intrigued by the sound of these.